Travel and study in London this summer with professor Kevin Petersen. In 2016 the world will observe the 400 year anniversary of William Shakespeare’s death. To mark this occasion, England will host an unprecedented number of theatrical productions, events, and exhibits to celebrate this cultural icon. This 3-6 credit abroad program will take advantage of this unique opportunity to engage with Shakespeare’s work and his continued influence. We will explore London and its cultural sites to help us understand how Shakespeare grew from a poet, to a commodity, to a legacy to this day. 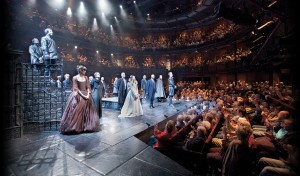 The Royal Shakespeare Theatre in Stratford upon Avon. We will also spend time in Stratford-upon-Avon, the home of the internationally renown Royal Shakespeare Company, to see performances and tour Shakespeare’s city and its attractions. Aside from theaters and historical sites, we visit British cultural institutions, see original publications of Shakespeare’s work, speak with theatrical and scholarly professionals, and participate in this momentous anniversary in Shakespeare’s backyard. We will visit a number of museums, historical sites, and London neighborhoods to broaden our understanding of English literary history and Shakespeare’s enduring importance as he is repacked and repurposed from everything to films to coffee mugs to comic books. “Creating Shakespeare” is designed as an introductory course; no previous experience with Shakespeare is required. Students may take one of two course offerings: one course will be a Gen. Ed class designed to orient students to the work and how it has been recreated over the centuries. The other course possibility, Special Topics, is for students who have already taken Shakespeare or who hope to satisfy a specific requirement and who want to use their experience to study at a higher level. Students can take 1 course or both.